What rifle should I bring? What bullet should I use? How many days should I allow? Is there a hunting season? Before the introduction of the horse and firearms, the American Indians drove buffalo herds over a cliff or into corrals and box canyons to kill them with lance and arrow. Chugwater, WY is the site of one such famous buffalo jump. On horseback, they became very skillful in controlling the horse with their legs and shooting the buffalo with a bow and arrow or a rifle. Quite a feat! We do not encourage this method of harvesting your trophy bull. We do recommend you bring a rifle and shoot from afoot. After all, how many Indians do you see buffalo hunting today? Bison are extremely tough animals to bring down. George W. Brown hunted buffalo from 1870-1874 and recorded the following: "I used a big fifty caliber Sharps rifle. It shot a hundred and twenty grains of powder, and the bullets were an inch and a quarter long. When one of these big (slugs) would hit a buffalo, whether it hit the right place or not, it would make him sick. It wouldn't be long until I put another into him. I have often shot a buffalo ten or fifteen times before I got him down." Rifle selection is very important. This rifle question has no absolute answer, just opinions. My opinion comes from harvesting numerous North American and African large game animals as well as many trophy bison. One must always remember that the primary objective in hunting is to harvest the game in the most humane and efficient manner possible. Bison are extremely difficult to bring down. They are easily excited and quickly generate adrenaline. A wounded bull will charge with the intent of doing the hunter lethal harm. With this said, let's look at selecting a good rifle to bring on your trophy hunt. The first choice to be made is that of black powder or center fire. Black powder rifles have certainly harvested more bison than any other rifle. A .50 caliber Thompson Black Diamond will do a great job! Without a doubt, the Sharps rifle has killed more bison than any other black powder rifle. My personal choice here is the 45-70 Sharps. This bullet seems to really hit them hard and do tremendous damage. Just ask John LaRue, a high school chemistry teacher from Longmont, CO who took his record book bull with only one shot. He did use one additional insurance shot at my request. The 45-70 Shilo Sharps did a great job that day! Hunter safety and compassionate harvesting are primary considerations at Thousand Hills Bison Ranch and our rule is "If they're standing, you're shooting". The development of center-fire rifles has, I believe, misled some hunters into some ungrounded thinking. It seems that a good number of modern day riflemen think that faster is better. So, they naturally load for maximum velocity. And in certain hunting situations (prairie dog hunting for example) they may be correct. But any African professional hunter will quickly tell you that knockdown power is the most critical consideration when bagging an elephant. The same is true for the American Bison. My belief is that bigger is better and the greater the energy coefficient the better. No matter how hard you throw a Ping-Pong ball at someone, it is not going to inflict serious damage. But throw a baseball one hundred miles an hour and it becomes a dangerous weapon. I have seen many a 2,000 pound bull receive five shots from a .300 Win Mag to just stand there and say "is that all you have?" and then proceed to walk off. Although mortally wounded, he continues to lumber about just as his brother the Cape Buffalo does when shot. Even a hot .375 can just go right through a big bull's lungs without doing a great deal of damage. Ryan Benassi of Littleton, CO will attest to this. Ryan made 5 nice shots…all landing in a pie-pan size area in the bull's lungs. We saw them exit the bull and land in the hillside behind our quarry. With his gun empty and the bull starting to go over a distant hilltop, I quickly handed Ryan my Sako .375 H&H Magnum. After several more rounds, the bull finally went down. In another forty yards, he would have reached an extremely rugged area that would have required our taking him out in small pieces--over the next six or eight hours! The moral of the story is: heavy, slow bullets, which have a lot of knock down power (energy), are the best! As far as the caliber is concerned, anything in the .30 caliber range or bigger is good. A .416 or .458 will do a great job, but it will be important for you to know the drop at 300 yards if you sight in at 200 yards. We try to keep most of our shots at 100 yards or less, however, there is always the bull who takes off at a dead run when he spots us and we end up with a 200-300 yard shot. A .375 H&H Mag is probably the best-suited center fire rifle and you will find it excellent on game of every continent. We want the best of both worlds: penetration and controlled expansion. Bison have tough, thick hides. A .44 magnum will bounce off of their foreheads. This recently happened at a packinghouse with the bullet ricocheting through the stock trailer. Fortunately, no one was injured. Mike Goodart, of Alamosa, CO, saw his .338 bullet deflect off of his bull's skull plate. Nosler partitions seem to be good, although Swift and Barnes also make comparable bullets that perform well. Solids (or full metal jacketed) bullets should be used for the brain or shoulder shots described below. Remember, however, no caliber or bullet can supercede proper shot placement. Solids are unnecessary unless you go for the shoulder shot first to slow him down and them follow with a soft point. 175 grain is the minimum recommended bullet weight. A good round for the .375 H&H Mag is the PMC 270-grain Barnes X bullet which produces 2,690 fps muzzle velocity with 4,337 ft. pounds of muzzle energy. There are four primary targets: brain, shoulder, lung and heart. The brain shot is certainly the most difficult. Here you would aim two inches below and two inches behind the ear. A full-metal-jacketed bullet is used for this shot due to the tough skull. I believe this to be a difficult shot because bison seldom stand still. It is a small bulls-eye, but when hit, they drop like a one ton safe from twenty floors up. The shoulder shot can be used to slow the bull down. A solid bullet (or full metal jacket) is frequently used here to get as much penetration as possible. A soft-nosed bullet in the lungs generally follows up this shot. This is not a bad choice, although my favorite follows. The lung shot is certainly the easiest and surest. A bison's large lungs make for an easy target. One good shot in the lungs will kill a bull, certainly not instantly, but death is inevitable. As most animals hit in the lungs, they will leave a good blood trail, which is easy to follow. Another advantage of this shot is that there is no damage to edible meat. This is the choice of most modern day hunters as they follow the example of the old-time buffalo hunters. Use a soft-nosed, controlled-expansion bullet for this and the heart shot. The heart is located low in the chest cavity. It is large but well protected by the shoulder and leg. In order to hit the heart, the hunter must wait for the animal to take a step forward, thus exposing the vital organ. Even when well hit in the heart, a big bull can run quite a way -- pumping massive amounts of blood in the process. I once heart shot a zebra in Zimbabwe only to watch him run over 150 yards before expiring. As I said earlier, there can be no substitute for accurate shot placement. Here is what Joe S. McCombs from Randolf County, Alabama brought on his buffalo hunt: a span of mules, a wagon, 800 pounds of lead, five kegs of powder, a 16 pound Sharps sporting rifle and a reloading outfit. Of course this was in the fall of 1875 as he and his three skinners set out for a six-month hunt near Sweetwater, TX. He killed a little over 2,000 buffalo on this hunt! Fortunately, you will not need to bring everything Joe McCombs took on his buffalo hunt! Rather, I suggest you bring whatever you would normally bring on an elk or deer hunt. You'll find your accommodations at lodge to be excellent. This Orvis Endorsed resort is famous for its culinary delights and hospitality. This eliminates your bringing a lot of unnecessary camping and cooking gear. Proper clothing is vital. Camouflage which blends with sage and rabbit brush is a must. Bison do not see as well as antelope, but they do see about as well as cattle. Comfortable hiking boots and layered clothing are important. Your hunting season of November through January can be quite cold since we are at 8,000 feet above sea level. These cold winter temperatures make for an excellent winter robe. Hunter orange is not required. Most days are sunny and surprisingly, 15-25 degrees is not uncomfortable if you are in the sun. Twenty rounds of ammunition should be sufficient unless you think you might encounter a problem zeroing your rifle. Binoculars and a camera are must items. Bison meat is great tasting and great for you! Most people say bison is the most flavorful meat they have ever tasted, with a sweeter and richer flavor than beef. It is not 'gamey' or wild tasting. Bison meat is naturally flavorful and tender. On a cost comparison, bison falls into the gourmet category at your supermarket or meat market. The value of bison is what you get, not what you pay. Nutritionally, you are getting more--more protein, more nutrients, for less--less fat, less calories and less cholesterol. Our bison have not received any growth stimulating hormones or sub-therapeutic antibiotics -- the meat is considered organic. 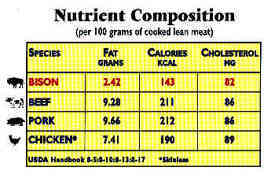 As you can see from this chart, bison meat is lower in fat, calories and cholesterol than beef, chicken or pork! You get the best of both worlds -- taste and healthfulness. Immediately after your harvesting the bull and all the photos are taken, we promptly transport the carcass to our local, State inspected, meat-packing house. Your trophy bull will yield a hanging carcass of approximately 850 to 950 pounds. After boning, you can expect to get about 500 pounds of meat. He will fill a 30 cubic foot freezer! The steaks on these old bulls are flavorful and tender, if you marinade and utilize a little Adolph's Meat Tenderizer. The balance is burger, which can be turned into a variety of smoked meat products such a jerky, hot sticks or salami. At the supermarket price of $5.00 a pound for bison burger, you can see that your hunt is really just shopping (try this line on your wife). Since the animal has not been slaughtered at an USDA plant, it may not be sold for commercial purposes. UPS shipping of the meat is commonplace for our packinghouse. Another idea for those travelling by pickup truck is to put a chest freezer in the bed and plug it in. If the meat is put in cold and you don't open the lid, everything should be cool when you arrive home. Overnight stops allow you to plug in the freezer. Any meat you are unable to transport home will be given away under through a program such as Sportsmen against Hunger. No meat is ever wasted! No, a Colorado hunting license is not required. A Thousand Hills Bison Ranch Bison Harvest Permit will be issued to you and is included in your trophy fee. You have three choices here: a life-size mount, a full shoulder mount or a robe with a European skull mount. Life-size is not for everyone because of the space required and costs. A shoulder mount is breathtaking! It takes up about 44" vertically, 30" horizontally and protrudes out from the wall about 36". Our local taxidermist does an outstanding job on shoulder mounts . He does many bison each year and I personally think he is as good on buffalo as I have seen. Beginning with a standard mannequin, he builds up the form to match your bull. This alone can require several hours. By turning the head down and to the right or left, he puts life into the animal! Even with the full shoulder mount, you will have a nice back skin to tan. It will finish approximately 3' by 9' and tanning runs $10 per square foot. Back skins look great draped over your favorite easy chair. The European skull mount along with a buffalo robe is another good choice. Skull mounts don't take up as much space in your trophy room and the robe is gorgeous! Allow about $900 for tanning. Most robes will finish about 9' by 8'. Three days is generally sufficient. The first and last days are for travel with the middle day devoted to the trophy hunt. Should time permit, we heartily encourage you to take a couple of extra days to enjoy the local sightseeing attractions. Bison may be hunted anytime during the year. The hot, summer months make for a problem in keeping the meat from spoiling. Capes are best from Nov. 1 through the end of January, so this is when most of our hunting occurs. Booking early assures you of the best time for you and your trophy.